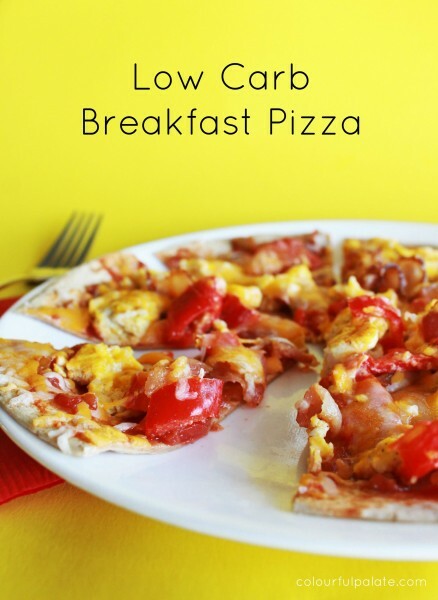 Low Carb Breakfast Pizza was posted on August 11th, 2015 and is filed under Breakfast, Kid Friendly, Low Carb, Main Dishes, Protein, Recipes. This entry has 1 comment. You can follow any responses through the RSS 2.0 Comment Feed. A few times a week I make myself a mini “pizza” made from a low carb tortilla. I put on a little organic tomato sauce, some protein, and veggies and bake it in the toaster oven. It’s perfect for those days where a salad doesn’t “cut it”. I had this idea to make a breakfast pizza. It turned out so good. You know you want a slice! This is ideal for a weekend brunch or a lazy morning in bed. Serves 2. Preheat a non-stick frying pan and oil. Slice your pepper finely and cook for 2 minutes. With a fork, scramble your eggs and add to pan. Keep flipping until done. Fry bacon and slice into bite-size pieces. Spread salsa on tortilla wraps – I use these low carb wraps from Mission. Add eggs and pepper to each “pizza”. Sprinkle bacon pieces on top. Add cheese and bake for several minutes, or until the cheese has melted and the edges of the wrap have crisped. Slice into 6 pieces and enjoy! 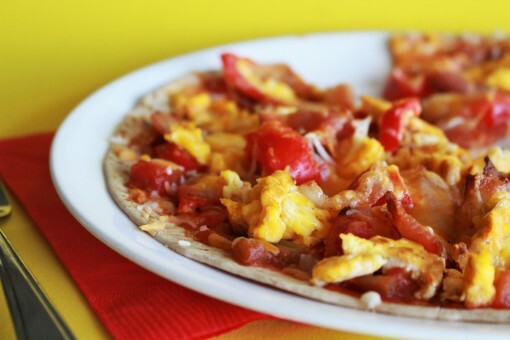 Have you had breakfast pizza before? You are brilliant! I have got to make this!